Joran van der Sloot is now on his way back to Peru to face charges in the murder of 21-year-old Stephany Flores. Investigators say Flores was found on Sunday by a hotel maid face-down, her neck broken, in a hotel room registered under van der Sloot's name. Five years ago, 18-year-old Natalee Holloway went missing on the island of Aruba and van der Sloot was the chief suspect in that case, as well. He was never formally charged in Holloway's death. On "The Early Show" Friday, Natalee's stepfather, "Jug" Twitty and Carol Standifer, a close friend of Natalee's mother, Beth Twitty, discussed Flores' murder. Twitty said he hopes Flores' investigation in Peru is conducted better than Natalee's in Aruba was. Twitty said, "We could have had the answers in the first couple of days down there had they done their job right. And this should have never happened what's happened in Peru. And I actually lay blame on the one person in particular, that's the (police commissioner, Jan van der Straten), in charge at that time. Because he knew what happened. And it just happened to be political connections and friendship that kind of let Joran slip off the hook." As for the Holloway family, Standifer said Beth Holloway is "overwhelmed" now at the news of Flores' death. "She's just really very disturbed," Standifer said, adding, "Every Memorial Day weekend, it's hard for her and it's hard for all of us who went through this because it brings it back, and we remember what happened." 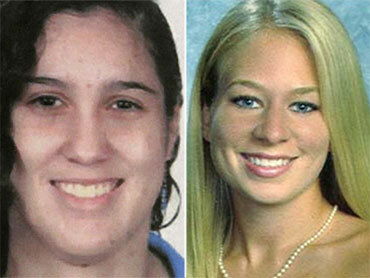 Could the arrest and possible prosecution of van der Sloot be enough for the Holloways? Twitty told "Early Show" co-anchor Maggie Rodriguez, "It's a start. It's not enough. I think what Beth has worked so hard for, and will continue to work hard for, is to find out what happened to Natalee. And to find if it there are remains from Natalee. That's what we want." Rodriguez pointed out the FBI is also charging van der Sloot with extortion after he allegedly accepted $250,000 to reveal the location of Natalee's body -- the information he provided turned out to be false, authorities say. Standifer said she's not surprised by these charges, nor about any of the other news she's heard about van der Sloot. She said, "There's nothing that could happen that would be shocking because we've had such unusual events happen throughout the last five years."